The Bridges Foundation was established in 1987 by Jack & Nancy Bridges. The foundation was established with the belief that a small foundation can be highly selective and much more cost effective than large charities facing high operating and administrative expenses. The Bridges Foundation Trustees (left to right): Luke Fitzpatrick, Andy Fitzpatrick, Jake Fitzpatrick, Nancy Bridges, Jack Bridges and Kathy Bridges. Appreciation is extended to past Trustees: David Thompson, Blair Cummins and Karen Wassenberg. Banner Caption: Flower display at the Oregon Garden. Banner Caption on Trustee Pages: Wood art on windows with the reflection of Oregon white oak at Frank Lloyd Wright's Gordon House. 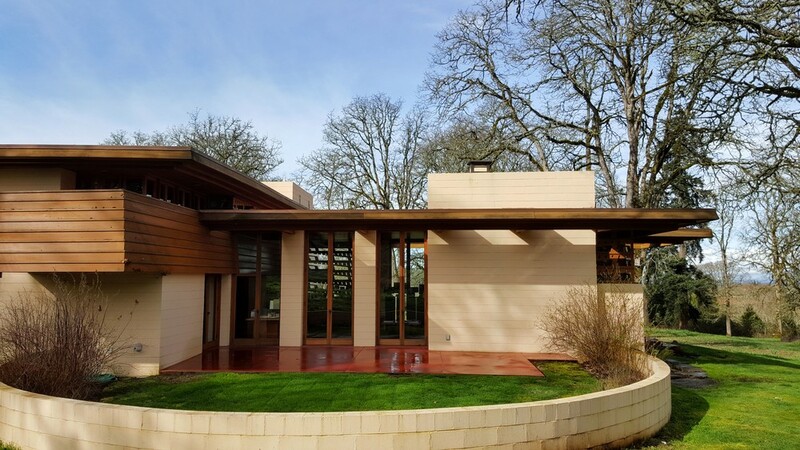 The Bridges Foundation provided $6,000 to the Oregon Garden and $3,375 to assist with handicapped access to the Frank Lloyd Wright designed Gordon House. The Oregon Garden, created through a partnership between the Oregon Association of Nurserymen and the City of Silverton, opened to the public in 1999. The Garden uses treated wastewater from the City of Silverton which is filtered through a series of 25 ponds. The Garden contains more than twenty speciality gardens and features an Oregon white oak grove which includes a 400-year old Heritage Tree. The Garden also sponsors festivals and concerts including the Oregon Garden Brewfest, Earth Day Celebration and the Willamette Valley Wine & Jazz Festival. In addition to eighty acres of botanical garden, the Garden houses the architecture of Frank Lloyd Wright. Built in 1964 and known as the Gordon House, it is the only Wright residence in the Pacific Northwest open to the public. In 2006 Moonstone Garden Management Inc. took over operations of the Garden with the Oregon Garden Foundation retaining ownership. Moonstone also purchased eleven acres from the City of Silverton adjacent to the Garden and constructed the “Oregon Garden Resort.” The Resort offers 103 rooms of cottage style lodging, a restaurant and lounge, and a full service spa and outdoor pool. The Resort has become one of Oregon's most popular venues for weddings, family reunions, and meetings.